There are many photographs of the historic drawbridge in downtown Mystic, CT. However, there aren't many taken at night. We decided to try and photograph the bridge in different chunks...here is the operating lever arm and wheel. This picture was taken at night using a long exposure as well as a light painting technique (read on). Light Painting is a way to add a little extra glow to a long exposure night time photograph. For this photo, we set up our camera on a solid surface on one side of the Mystic Drawbridge and took a 20 second exposure. The time lapse allowed us to gather enough light to render most of this scene, and adds some dramatic flair (the streaking glow of the car headlights and taillights in the foreground as they drive by). However, in a lot of our test shots, we just weren't getting the depth in the scene we needed. The bridge's structure and machinery linkage looked flat and grey. 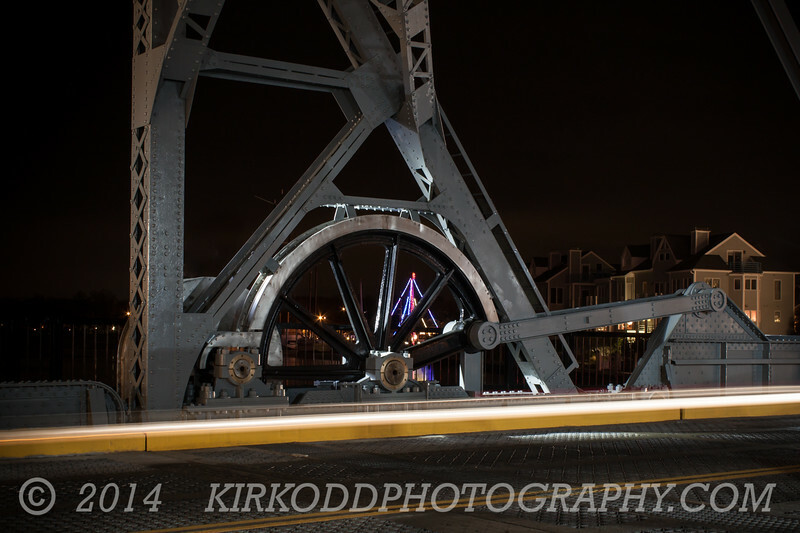 So, we decided to play with the lighting to draw the eye to this historic drawbridge's working parts. This is where light painting comes in. While I pressed the shutter (using a 2 second timer to make sure the camera didn't wiggle) Kirsten moved behind the steel support next to the spoked wheel (out of sight of the camera). Using a high-CRI LED flashlight, she "painted" the inside of the wheel and the I-beams with light while the camera exposed the photograph. This draws your attention to the subject (the bridge machinery) by adding contrast and reflections. With light painting, you can be selective. By pointing the flashlight at certain parts of a structure for a few seconds, you can set the intensity level of the light for different parts of the picture.